This is Erica's go to cocktail. It's super easy, pretty, and great for offering something a little special whether guests want it spiked or not. Muddle your herb of choice at the bottom of a glass. Add spirit of choice and ice. Top with the sparkling lemonade, and garnish with a fresh herb sprig. Very refreshing. 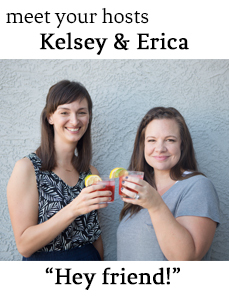 Erica is back from the Storyline Conference in San Diego and feeling crazy inspired as she finishes her book, and Kelsey's been making great progress on developing her e-course for working moms. In addition to project updates, Erica talks adoption happenings, and Kelsey has some cool job news. She's also really excited to try the genius Bullet Journal system, and is hoping to pick up a shiny new notebook to get started at Book People in Austin this week. Erica shares her tips to hosting a good party, including her favorite party hosting equipment, the triple crock, and we're loving these tips to a well stocked bar from A Beautiful Mess. Kelsey's currently obsessed with socklets. They're changing her work life, and she wants to spread this wardrobe revelation to future generations. Erica's obsessed with her new Capri Blue Volcano candle which she finally broke down and paid way too much for at Anthropologie. In neighborhood news, Saw Guy has a new project and a new nickname. There may or may not have been more apology cupcakes involved. The saga continues. Thanks so much for listening! Don't forget to subscribe to the podcast on iTunes and leave us a review to tell us what you think.